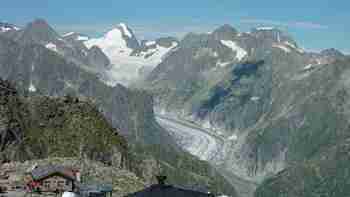 Following our itinerary, we decidingdecidedare decidedI don't know to head for a main point of interest : the Aletsch glacier. To get there, we must reachhad to reachwere to reachI don't know Eggishorn (2869 m) exclusively by cable-car. At the terminus, the platform offered a breathtaking view of the glacier. I was walking along a path, when I spied an information sign. I was stopping to readstopped readingstopped to readI don't know it. I was struck with surprise. I believed notcouldn't believemay not believeI don't know my eyes, It was so unexpected! It was writtenhas writtenhad writtenI don't know that the glacier's surface was a habitat for microorganisms such as the glacier flea. The small, wingless insect was believed to have adaptedhad believed to have adapted.were believed to have adaptedI don't know to life on the glacier's surface. Therefore, I concluded that the glacier fleas would be capablemay be capablecan be capableI don't know of surviving even at temperature as low as minus 30 Celsius and high U.V. radiation. In my way of thinking, they would be capable of being an effective anti-freeze agent. However, if the temperature of the glacier increased, the glacier flea would diediedwill dieI don't know with certitude. I kept to readkept on to readkept on readingI don't know the explanations: these glacier fleas stored sugar in their body fluid. They found their useful sugar in a microscopic algae which grew on the glacier, hidden into tiny pockmarks. called cryoconite holes, duggeddugdugedI don't know in the ice. The glacier fleas were also used to findinguse to finduse findingI don't know sugar in pollen which was carriedhad been carriedcarriedI don't know to the glacier by the wind. Let me tell you a riddle, another glacier oddity … Why has the glacier got a pink or red colour in a few areas ? I can explain to youcan explain youcould explain to youI don't know this phenomenon: the algae gives this pink colour to the glacier.